The 200-hour yoga teacher training program is designed to familiarize students to concepts of yoga philosophy and history, as well as teaching asana (postures), alignment and anatomy so that the physical practice of yoga can be furthered. The certificate provided at the end of this course allows the student to register with Yoga Alliance. The course includes pranayama (breathing) practices and meditation, as well as traditional chanting and cleansing techniques. This gives students all encompassing view of the yogic tradition and prepares them to become yoga teachers or just to enhance their practice and understanding of yoga. During this yoga teacher training, you will be staying at a 2-star hotel which it is located just around 20 meters far from the beach of Misano Brasile and from the beautiful promenade of Misano Adriatico. The rooms are air-conditioned, comfortable and well maintained. There will be meditation sessions twice a week, from 8:30 pm. Please note that the schedule is subject to change. Sundays are days off. All the seminarians can come to the course with one or two days prior to the course, to allow them to acclimate with the area. Evaluation will be carried out only for those students who have a minimum of 90% attendance in all 4 weeks of training. YMCD - Karmananda, Swami. Yogic Management of Common Diseases. Edited by Yoga Publications Trust: Bihar School of Yoga, 2010. RY - Vivekenanda, Swami. Raja Yoga: Conquering the Internal Nature. Kolkata: Advaita Ashrama, 2011. MMMRY- Niranjananda Saraswati, Swami. Mind, Mind Management & Raja Yoga. Yoga Dristi Series. Bihar: Yoga Publications Trust, 2011. YA - Kaminoff, Leslie, and Amy Matthews. Yoga Anatomy. 2nd ed. Champaign, IL: Human Kinetics, 2012. YOGAMEA India or Italy adopts the ancient approach to yoga to instill in each student the wisdom that yoga manifests. Teaching and learning is therefore designed in such a way that ethical practices are ingrained automatically in the students at the school. The day begins with the daily regimen (Dincharya) and ancient code of conduct. Activities are planned according to the seasonal code of conduct (Ritucharya). The concept of behavior chemistry (Achar - rasayan) is the concept that students are expected to imbibe. Maharishi Patanjali prescribed certain rules of how a person is expected to act in society (Yama) and how personal code and conduct (Niyama) is the expected and essential behavior for individuals to follow. We at YOGAMEA expect this behavior terminology to be understood and practiced sincerely and honestly by all students to the best extent possible. Before students register for the yoga teacher training they must be aware that this traditional teaching will differ from that of the west. There could even be a fundamental difference in the understanding of the yogic path as that which is taught in the yoga schools in the west. Modified exercises that go by the name of yoga are frowned upon by Rishikesh Yog Peeth and YOGAMEA and so only those students must apply for the course who are willing to commit to the strict regimen of the course. Discipline is an integral part of the training program and so the course routine must be strictly observed. Disrespect to rules and regulations could result in termination of studentship with no refund of fee. Absenting oneself from the scheduled program without prior permission of the teacher or manager concerned would be construed as a gross breach of discipline. A student must announce in advance if they intend to forgo a meal so that there is no waste of food. Yogamea does not make arrangements for guests of students. Any activity that is not related to the course is not permitted. Ensure you are on time for class or you will not be permitted to enter any class once it has commenced. Before departure from the school, students are required to return all library books and any other articles belonging to the school. Mimi is an international yoga instructor & creator of transformational experiences. She is a featured guest on Expert Profiles Atlanta & Make Everyday YourDay podcasts. When she’s not hosting her own podcast, SHIfT HAPPENS, Mimi loves traveling & teaching yoga. Mimi received her 200-Hour training in Hatha yoga, Vinyasa flow, & Ashtanga yoga in Costa Rica. After receiving her 300-hour certification from Rishikesh Yogpeeth in 2016, Mimi began teaching yoga anatomy & physiology & asana in Rishikesh, India. Mimi is also trained in Ayurveda and holds two degrees in Naturology. The venue used during this yoga teacher training is located around 20 meters from the beach, not so far from Rimini Malatesta old town and the famous small Country; "San Marino Republic" . It is located within the 2/3 stars Hotel Yoga City , Hotel Arno and Hotel Silvia, in Misano Adriatico Beach, that was a Roman settlement since the 3rd century AD, when a Gens Mesia received lands in the area and gave their name to the place. In 997 AD the Pieve di Sant'Erasmo, one of the most ancient churches in the province, was built, and from 1295 to 1528 Misano was a dominion of the Malatesta, who built a castle whose tower and entrance are still extant. After 1528 it became part of the Church State until 1861, when it was included in the kingdom of Italy. In 1862 the name was changed to Villa Vittoria then in 1935 became Misano Adriatico. Traditionally for long centuries an agricultural center, in the 1930's underwent a growing tourist development along the coast, as well as offering access to nearby medieval villages. If you're keen on castles, tracing the path of Dante, or just getting out into the countryside for a day on your day off, we can arrange excursions to a number of different places. For the duration of the yoga teacher training, you will get three Ayurvedic healthy vegetarian meals a day with refreshments, fruit unlimited water and tea available at any time. During the Sundays that you will spend with YogaMea, usually we offer fantastic excursions in the sea with a sailboat, or alternatively trips out of town that can see you visit the small medieval state of San Marino Republic, the birthplace of Raffaello Sanzio "Urbino", or the fortress of San Leo; many others are the alternative options to be evaluated at the time of your stay. There is a spa nearby where you can book treatments at an additional cost. International and domestic flights, boats, and transfers. Arrive at Marche Airport (AOI) or Bologna Guglielmo Marconi Airport (BLQ) (the best air destination). Ask for the Shuttle Bus your pick up service, from Bologna Airport, we will give you the least expensive and fastest solution to reach our Italian Yoga Hotel. Private Pick-up is available upon request. Kindly send an inquiry to YOGAMEA, for more information on airport transfers. From Marche Airport (AOI), there is a shuttle every 30 minutes direct to the train station, at a cost of 5 EUR and it takes about 30 minutes to arrive. Once at the train station in Ancona, You can buy a one-way ticket for Misano Adriatico (your destination). Depending on the type of train, the trip can take from a minimum of 55 minutes to a maximum of 1 hour and 45 minutes. From Bologna Guglielmo Marconi Airport (BLQ), the transfer to the Yoga City Hotel Center is easy, every 5 minutes there is a shuttle bus direct to the train central station of Bologna, the cost for the shuttle should be around 5 Euro, the shuttle will take around 15 - 20 minutes (depending on the traffic). From the Central Station of Bologna, every 20 minutes there is a train direct to Rimini or Riccione. Once you are at the train central, choose the most suitable train for you, depending on time / price. Some trains will stop at every railway stations and therefore will take a longer time (even up to 2 hours) to reach the yoga center. 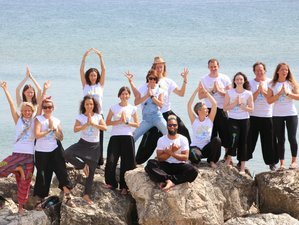 YOGAMEA organizes beach Yoga Retreats and Yoga Teacher Trainings in Italy, currently offering programs in Misano Adriatico in the Province of Rimini. The prices of the April 28 – May 25, 2019 course below include a last minute discount of 200 EUR per person. Book your spot now! Please do not purchase your flight tickets before you receive a confirmation about availability from YOGAMEA.